Official rhetoric frames the policy as a matter of prioritizing “felons, not families” — that is, people who have criminal records and thus, according to the US government, are a threat to public safety. But in reality, immigrants with convictions represent no such threat. Harsh immigration laws passed in 1996 made immigrants deportable for a very wide range of past convictions, including for low-level and long-ago offenses. The laws also stripped immigration judges of much of their power to consider deportation cases individually, weighing a person’s offense against other factors, such as their family and community ties in the U.S., the nature of their offense, evidence of rehabilitation, or the fact that they have already served their sentence, whether with jail time or a fine. 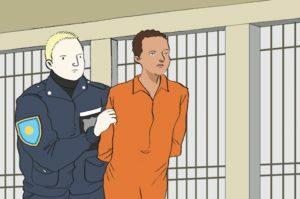 Factor in the growing entanglement of a criminal justice system that is institutionally biased against people of color, including immigrants, with an immigration system that lacks due process and it’s clear that immigrants caught up in the mass deportation system are treated unfairly and unjustly under the law. IDP works to disentangle the immigration and the criminal legal system, and to protect and expand the rights of immigrants caught up in those systems at every point of the process. Local police have become involved in the systematic targeting of routine civil immigration violations through the entanglement of immigration enforcement with a core federal criminal database utilized by local police officers. When immigrants have encounters with police, even for traffic offenses, they risk getting funneled into the detention and deportation system. This is because the police often run a person’s name through the FBI’s National Crime Information Center (NCIC) database, which includes, among other crime-related data, information related to outstanding criminal warrants. 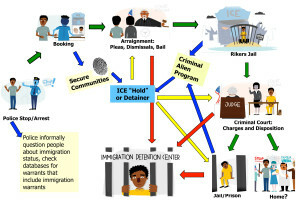 Since 2002, the U.S. Department of Justice began entering civil immigration information into this database, for example information indicating that ICE has ordered a person’s deportation, which often occurs without his or her knowledge. 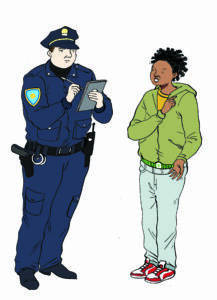 The resulting database “hit” can lead police officers to make an arrest, even where they would otherwise just issue a ticket. Nationally, IDP works with allies to advocate with law enforcement and Department of Justice for the removal of civil immigration warrants from the NCIC database. For the Task Force on 21st Century Policing recommendation that the National Crime Information Center (NCIC) database “should not include civil immigration information” click here. In New York City, IDP and our allies have made some progress in ensuring that New Yorkers are protected from these consequences. IDP was part of the coalition that worked on the IDNYC, a municipal identity card program for New Yorkers. IDP’s role in this coalition was to maximize protections for immigrant New Yorkers who are vulnerable to deportation. IDP advocated for the NYPD to stop arresting people based on civil immigration information that appears in the NCIC database. While we did not win this demand outright, the NYPD developed a new protocol that should result in significant protections. Individuals who could have been given a ticket but were brought into the precinct because they appeared to have an “immigration warrant” in the NCIC database will be released from the precinct without fingerprinting or referral to ICE. Please contact IDP if you have evidence that NYPD is not complying with this protocol. 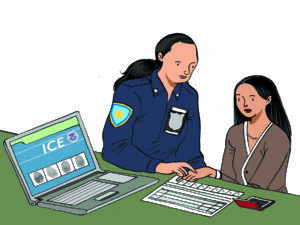 In 2008, the Department of Homeland Security (DHS) initiated Secure Communities (S-Comm) in which all fingerprints taken by the police are sent via the FBI to Immigration and Customs Enforcement (ICE), to determine whether the person in police custody is a target for deportation. In 2010, IDP and the Northern Manhattan Coalition for Immigrant Rights (NMCIR), spearheaded a statewide campaign which succeeded in getting Gov. Cuomo to suspend S-Comm in New York. In response, ICE terminated all statewide Memorandums of Understanding and activated the program mandatorily nationwide. Our focus shifted to campaigns to stop the honoring of ICE detainers through the ICE Out of Rikers Campaign. Due in part to sustained advocacy against S-Comm across the country, in 2014 the Obama administration announced a new mass deportation program called Priority Enforcement Program (PEP-Comm), essentially a revamped version of S-Comm. IDP has been working closely with our local and national partners to monitor the rollout PEP-Comm. 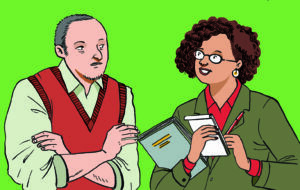 Learn about our work around detainers and PEP here. A central focus of IDP’s work involves helping criminal defenders, through trainings, mentorship, printed materials, and technical support, to provide noncitizen defendants with effective counsel to avoid and minimize the immigration consequences of their criminal dispositions. Our work at both state and national level gained added impetus in 2010, when the U.S. Supreme Court ruled, in Padilla v. Kentucky, that every noncitizen defendant in the United States is constitutionally entitled to be advised of the immigration consequences of a criminal disposition. We are also working to monitor cases addressing the scope of Padilla in post-conviction relief cases. And we are continuing to strengthen relationships between criminal justice and immigrant advocacy efforts to enhance partnerships to fight back against the targeting and vilification of immigrants with criminal records. In November 2014, the Obama Administration announced its Priority Enforcement Program (PEP-Comm), a revamped version of its mass deportation program Secure Communities (S-Comm), partly in response to sustained advocacy across the country. IDP has been working closely with our local and national partners to monitor the roll out PEP-Comm. We are currently developing appropriate strategies and sharing information and tactics with advocates across the country including a toolkit and a practice advisory for NYC detainer law. IDP has aso developed letter templates for public defender offices to invoke the rights of noncitizen clients in local jails and with DHS with respect to uncounseled ICE interviews in the jails. 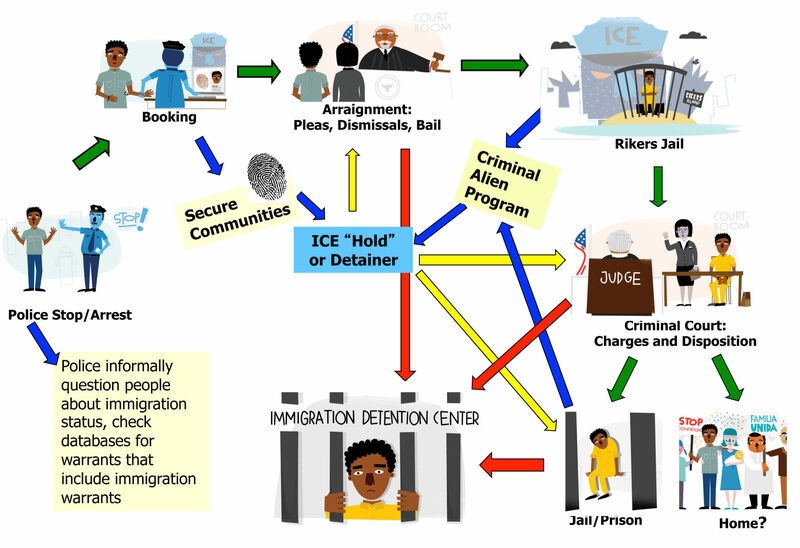 Learn about our work with the ICE Out of Rikers Campaign, which won groundbreaking detainer legislation passed by New York City Council in December 2014. This legislation dramatically expanding existing city laws that limit the circumstances under which the City will honor a detainer issued by U.S. Immigration and Customs Enforcement (“ICE”) or otherwise cooperate with federal mass deportation programs. In addition to fighting ICE entanglement with police, IDP has been working to stop ICE collaboration with the NYC Probation Department and ICE home raids and community arrests. IDP has been monitoring ICE arrests at homes, courthouses, and shelters since April 2013, with the support of community organizations and attorneys throughout the New York metropolitan area. 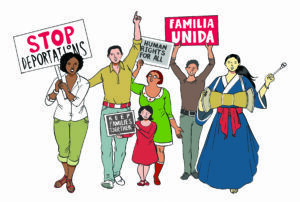 In addition to developing Know Your Rights materials and trainings, IDP and Hispanic Interest Coalition of Alabama (HICA) are plaintiffs in a Freedom of Information Act Request (FOIA) filed by the Center for Constitutional Rights on October 17, 2013 on ICE home arrests. IDP’s Report on ICE Home and Community Arrests, a collaboration with the Center for Constitutional Rights, will be released in 2016. Another ICE tactic for identifying and detaining immigrants is by requesting that probation departments not only share information on those under court-ordered supervision, but also that local officers arrange meetings with immigrants to help ICE make arrests. When we heard of people under city supervision being picked up by ICE at the probation office, IDP coordinated information-gathering and successful advocacy with our allies to end the New York City Department of Probation‘s regular practice of collaborating with ICE. The Department of Probation eventually passed a policy of limited ICE engagement modeled after New York City’s policy.